Jesse Glick added a comment - 2015-05-07 19:48 Partly covered by JENKINS-26107 . Does this issue also intent to cover the build page when it shows the outcome of prompting the user with the input step, i.e. "This was approved by user ..."? I have several approvals in a single build, and I can't tell which is which from the list as they all say the same. Martin d'Anjou added a comment - 2015-10-14 23:09 Does this issue also intent to cover the build page when it shows the outcome of prompting the user with the input step, i.e. "This was approved by user ..."? 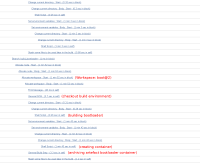 I have several approvals in a single build, and I can't tell which is which from the list as they all say the same. Martin d'Anjou no that would be completely unrelated. Jesse Glick added a comment - 2015-10-14 23:42 Martin d'Anjou no that would be completely unrelated. Need to revisit. Might have been covered by JENKINS-30088. Jesse Glick added a comment - 2015-11-25 14:41 Need to revisit. Might have been covered by JENKINS-30088 . Would need JENKINS-31582 to capture step arguments. Jesse Glick added a comment - 2016-04-08 18:55 Would need JENKINS-31582 to capture step arguments. Since there are already labels coming from many steps, and JENKINS-26107 allows you to easily add more labels, I think the only thing really missing here is a way to look at step parameters. Jesse Glick added a comment - 2016-04-08 18:57 Since there are already labels coming from many steps, and JENKINS-26107 allows you to easily add more labels, I think the only thing really missing here is a way to look at step parameters. Is this feature in the Pipeline 2.2 now implemented? Although JENKINS-26107 is closed I see no possibility to assign the sh a label and it just appears as a " Shell Script" in the pipeline view. Any idea how to achieve this? Attila Strba added a comment - 2016-09-21 13:35 Is this feature in the Pipeline 2.2 now implemented? Although JENKINS-26107 is closed I see no possibility to assign the sh a label and it just appears as a " Shell Script" in the pipeline view. Any idea how to achieve this? Our jenkins pipelines are quite complex, running several parallel stuff, and we have pretty hard time to analyse which step of the pipeline is doing what, or where to look for console log. BlueOcean gives a better visualisation but since it is somehow unstable on our server and runs very slow currently it is not usable for us. Jesse Glick What do you think about this? Or is there any other possibilities to provide information in the pipeline stepps view? Thank you very much for the help. Attila Strba added a comment - 2016-11-14 08:45 - edited Our jenkins pipelines are quite complex, running several parallel stuff, and we have pretty hard time to analyse which step of the pipeline is doing what, or where to look for console log. BlueOcean gives a better visualisation but since it is somehow unstable on our server and runs very slow currently it is not usable for us. It would be amazing if it would be possible to add a comment to the most relevant pipeline steps. It would make tracking down problems easier. Just an example a mocked up pipeliene step view: Jesse Glick What do you think about this? Or is there any other possibilities to provide information in the pipeline stepps view? Thank you very much for the help. stage suffices for most of that. Jesse Glick added a comment - 2016-11-15 14:21 stage suffices for most of that. Jesse Glick so you mean I should pack each call to sh to stage? so you mean I should pack each call to sh to stage? Interesting ones, yes, or where appropriate multiple low-level steps in one stage, or nest them as needed etc. Applies only to deprecated stage. stage taking a block may be used freely inside parallel. Jesse Glick added a comment - 2016-11-15 14:46 so you mean I should pack each call to sh to stage ? Interesting ones, yes, or where appropriate multiple low-level steps in one stage , or nest them as needed etc. it was written we shouldn't use stages under parallel Applies only to deprecated stage . stage taking a block may be used freely inside parallel .